Is there a future for ISIL? In recent months, the world shudders as the militants of the Islamic State of Iraq and the Levant (ISIL) carry on their violent spree. Originally this group was created by the US after the fall of Saddam Hussein, as a part of a project of establishing a “new democratic Iraq”. This project was doomed to fail, just like all the previous attempts by Washington of redrawing the Middle East map. From the very start the White House has been unable to recognize the potential danger of its “political formula” that was both inaccurate and explosive. A similar Western project that had been put in place “in the name of fighting the Soviet threat,” resulted in the rise of Al-Qaeda and the Afghan Taliban, both were funded with CIA money. One can also mention an attempt of putting the Muslim Brotherhood in power in Egypt and the fruitless efforts of toppling Bashar al-Assad in Syria, the latter move had been publicly supported by US Senator John McCain. In fact, the ISIL militants have been acting boldly since the first manifestations of Washington‘s sympathy towards them, at that point in time they were perceived as members of a “moderate opposition in Syria and Iraq.” But their leaders have become assured of their exceptionalism, assured that would enjoy impunity far too easily. From the first days of the Islamic State declaration, while mimicking US arrogance, they have been violating a number of universally recognized legal principles. Firstly, it is worth noting that from the point of view of the theory of law, an organization can not be called a “state” since it is lacking a number of defining characteristics. The area ISIL claims to be their own is assigned to the recognized states, particularly Iraq and Syria. In addition, the Islamic State has stated that is going to occupy the Levant, which refers to the territories of a number of countries of the eastern Mediterranean that includes Syria, Lebanon, Israel, Jordan, Palestine, Egypt and Turkey. In addition, there is no body of law implemented in the Islamic State, a body that constitutes the binding rules of conduct that are essential in actual states. As for the Shariah law, that ISIL is citing most of the time, it is nothing more than a set of religious norms, the highest law of a Muslim state, but modern Muslim societies demand additional standards that would regulate legal relations. Above all, the financial basis of any state in existence is provided by a system of taxes and fees. Muslim tax systems in its modern state is unable to satisfy the demands of the Islamic State. ISIL has no budget, no financial institutions, nothing… Cash inflow is provided by spontaneous donations made by individuals that sympathize with the Islamic State ideology, along with oil profits. It would be naive to assume that the international community would refuse to buy certain oil due to its origin. All of this revenue is serving a single purpose – to ensure that ISIL military and terrorist activities continue, the Islamic State is not going not to solve anybody’s social problems. It should also be noted that the principle of justice is one of the governing principles of Islamic law. Islamic rulers have always been preoccupied with supporting their people, especially those who found themselves in dire need, in accordance with the lines of the Qur’an and Sunnah. However, the Islamic State couldn’t care less. As for the population, which is yet another defining attribute of a state, it’s a big question as far the Islamic State is concerned. 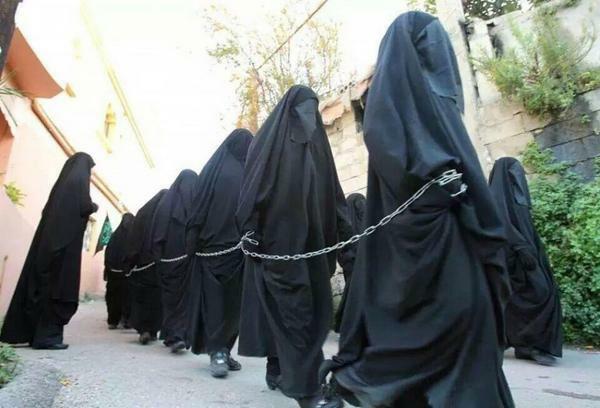 Any population must be able to reproduce, but all the activities of ISIL, as mentioned above, are aimed at fighting external enemies, hence its population is increased by the capture of women. But Islam has always condemned violence against women! Throughout its history Islamic civilization, especially the Sunnis, defended women’s right to marry voluntarily. The relationships between the sexes outside of marriage are generally considered adulterous, and it is believed to be one of the most grievous of sins in Islam. Violence against women of other religions is still a grave sin, since the Qur’an explicitly allows Muslim men to marry Jews and Christians, and such people have the same set of rights as Muslims. The Islamic State can not be considered an Islamic organization. The ideas, principles and methods of the ISIL militants are in direct contradiction to the norms of the Qur’an and Sunnah. Violence, the killing of Muslims and the “people of the Book” (ahl al-Kitab), ie Jews and Christians, to whom God, as well as to Muslims, revealed his will and gave religious and moral instructions, have always been considered the second gravest sin in Islam. However, ISIL is clearly urging its followers to kill the Shiites. Hence, this organization is using Islam as a cover when in reality it has nothing in common with this religion. So what is attracting people from all over the world to join the ranks of the ISIL militants? Primarily their impunity. At the present stage of development of international relations any seizure of territory is recognized as an act of aggression that could lead to the consequent use of force against the aggressor. However, the example of ISIL shows how helplessness the international community is today. The organization was created in Iraq, once the United States initiated the destruction of this state. At a certain point in time it could no longer be fully recognized as a state, since there were no government bodies, the Parliament ceased to exist hence there were no laws to be passed, while the real power was divided between various factions. As a result, a country that had been completely torn apart by internal feud, was overrun by radical Islamists. And since there was nobody to stop ISIL militants in Iraq it has been transformed into a springboard for the further spread of the Islamic State’s wicked ideas. Now, once they received the financial assistance and the support they needed, after capturing oil and gas production lines, ISIL militants are ready to drown the Levant in blood. Since the territory occupied by ISIL militants is officially attributed to other states (Iraq, Syria), in order to carry out air strikes, or any other form of military operation, a state or a group of states must obtain the permission of Iraq and Syria along with the UN Security Council first. Given the fact that territories that the Islamic State believes to be its own are populated by radical men and women prisoners, any strike against this group can potentially endanger civilian lives. In addition, the countries of the Middle East, North Africa and even Central Asia have already been infiltrated by ISIL agents that are preparing local radicals to revolt against their governments once the time is right. But the Muslim states are not going to suffer the plots of ISIL alone, the EU, and even the United States are next in line. Once jihadists with real combat experience begin returning home the problem of “domestic terrorism” will become as topical as it can possibly be. Especially if one is to consider the statements the Islamic State has made about its forthcoming attacks. Especially when such plans have already been successfully executed in the London Underground. That is why the fight against ISIL should not be based on the illegal air strikes Washington has been carrying out in Iraq and Syria, but instead it should be a joint effort that would target radical extremism wherever it manifests itself.